Residents of Nkuusi Village, Busamuza Sub County in Buikwe District meeting VODP officials to sort out their compensation woes recently. PHOTO BY DENNIS SSEBWAMI. BUVUMA. The controversy surrounding compensation of residents who were displaced by the oil palm project on Buvuma Islands in Lake Victoria has taken a new twist with a section of residents disowning their colleagues who claim that their properties were undervalued. 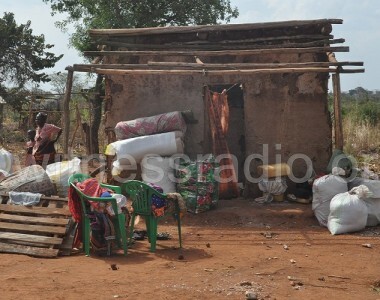 The group of 205 residents (led by Mr Sefu Buluuba) from eight villages in the sub-counties of Busamuzi and Buwooya and Buvuma Town Council, said they are satisfied with the compensation packages received from government and wondered why their colleagues included their names on the list of those complaining. “We really don’t know the intentions of people who included our names on the list of those who claim that their properties were undervalued. 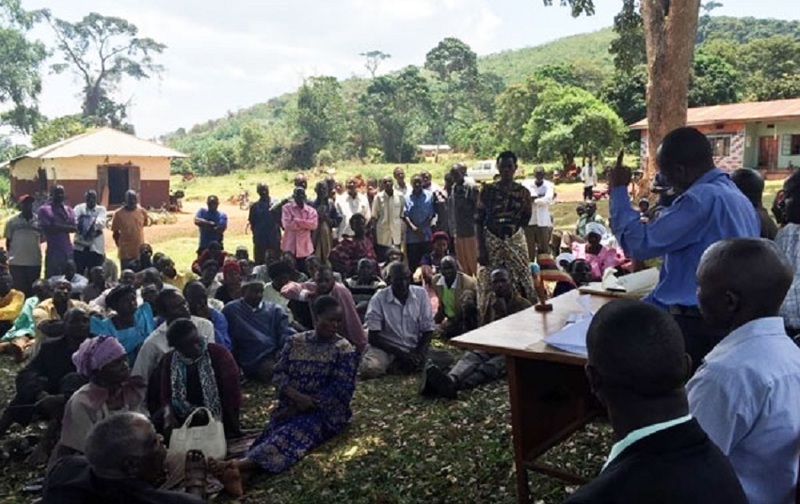 On our part, we are contented with the compensation packages we received from government and we have already vacated our land to pave way for the project to kick off,” Mr Buluuba, who has since relocated to Kansansa Village, Busamuza Sub County told Journalists in Buvuma Town on Saturday. Another complainant, Mr Alex Kiyira, a former resident of Bukwaya Village said he was considering suing those who put his name on the list of those complaining about unfair compensation. “I was shown the valuation and survey report which I also signed and I am not complaining about the compensation package I got. Whoever included my name on the list of disgruntled residents has his own motives and once I know him, I will drag him to court,” Mr Kiyira, who has since relocated to Buwanguzi Village, said. The development comes a week after the High Court in Mukono on June 18 dismissed a petition in which five residents in Buvuma Islands had sought an injunction stopping the oil palm project until the case they filed against government complaining about unreasonable compensation and creation of ghost beneficiaries on their land is disposed of. Mr Rajab Hassan, the chairperson Ssese Village in Buwooya Sub County said he was also surprised that his name appeared on the list of those who petitioned court yet his piece of land was not considered under the oil palm project. “l was surprised when l got to know that my name appears on the list of residents who are complaining. l decided to rush to court so that l inform the judge that I am not among the complainants, because I am still occupying my Kibanja (a plot of land) and my land lord did not sell off his title to the project managers,” he said. The Buvuma Oil Palm Project, which was unveiled in 2008, has failed to kick off due to endless land disputes and environmental concerns. 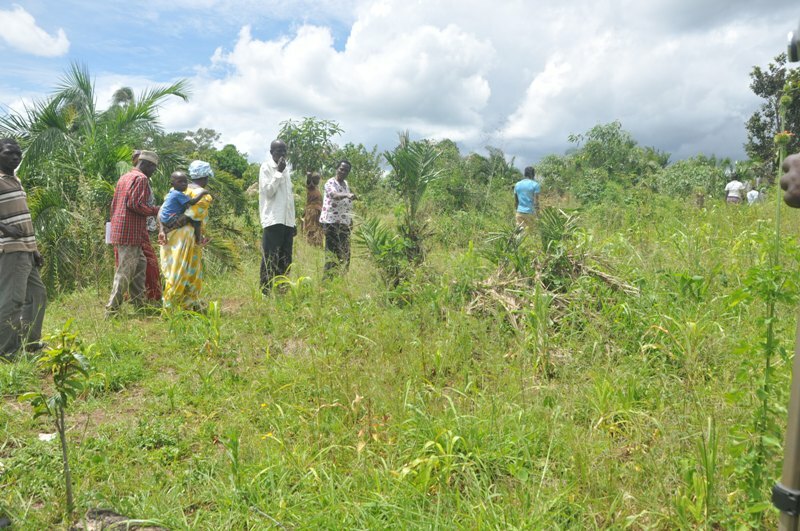 The project, a component of the Vegetable Oil Development Project (VODP) which is under the Ministry of Agriculture, is implemented by Oil Palm Uganda Limited, a subsidiary of Bidico Uganda, which manages oil palm plantations on Bugala Islands in Kalangala. The project targets 10,000 hectares and 6500 will be used by the project and the remaining 3500 hectares will be utilized by out growers. When contacted, Ms Connie Masaba the VODP project coordinator was upbeat about the development, saying compensation woes had hindered the project on the island. “We are happy to hear that majority of the residents have started realizing the importance of the project. 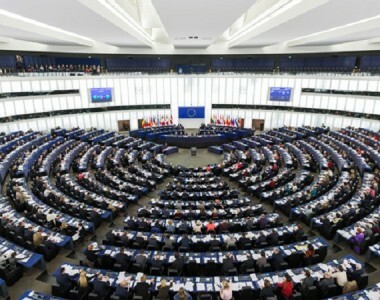 A handful of them have been confusing others but they cannot stop us from embarking on the project,” She said during a telephone interview yesterday. Ms Masaba said the process of land acquisition was based on ‘willing buyer willing seller’ principle which applied to both landlords and tenants and no resident was coerced to give away their land. She explained that they engaged consultants who used valuation rates that are set by district land board and approved by the Chief Government Valuer, to determine the amount to be paid to the tenants for their properties. 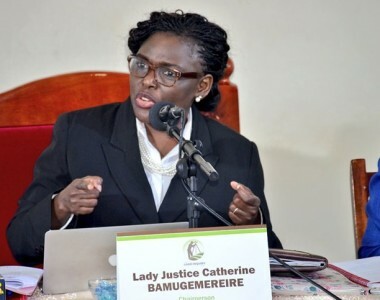 She said government has so far spent Shs67 billion on compensation of 54,442 project affected persons (PAPs) and a total of 7,591 hectares have been secured. Busamuzi Sub County Chairperson, Mr Charles Aisu said some residents who went to court were simply misguided and think government will give them more money. “Those five residents who went to court are all from my sub county [Busamuzi]. What l know, they just want to delay the project. Four of them got their compensation money two years ago and even vacated the land. They misused the money, and now want to get more, ’’ he said. Mr Aggrey Wakasi, one of the five petitioners said although the majority of their colleagues had ‘betrayed’ them, they will not relent in their quest to get fair compensation for their land. “Even if we remain two, we shall pursue our case until we get justice,” he said. Recently legislators on the Parliamentary Committee on Agriculture advised government to swiftly implement the oil palm project, warning that any further delays would give unscrupulous individuals a chance to grab the land earmarked for the project. The MPs also directed the project manager to quicken the process of compensating the PAPs, who refused to vacate their bibanja (plots) holders, claiming their property was undervalued. However, they urged the project implementers to ensure that there is no encroachment on the existing forests and wetlands during the implementation of the project. Buvuma Main Island has about 200 square miles (517km) of land and 26 gazetted forest reserves.